We all know very well that there are many functions that little by little the most used instant messaging application WhatsApp has been adding to its application, we already know some of the functions of WhatsApp that could come soon. Hence, now in this post, we will show you an awesome tutorial in which we have mentioned how to change WhatsApp phone number without losing chats and groups. There are many functions that little by little the most used instant messaging application WhatsApp has been adding to its application, we already know some of the functions of WhatsApp that could come soon. However, it has been incorporated for quite some time the function to change number, which allows us to change the number of the mobile phone associated with our WhatsApp account on the same mobile. Hence, it is important to know that this function must be performed before verifying our new number. 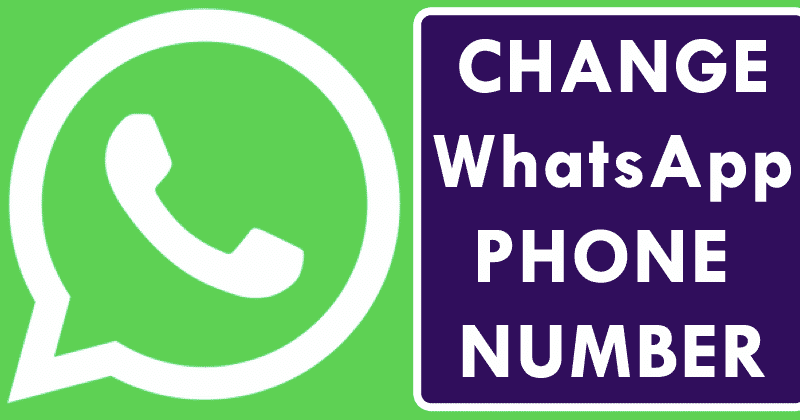 This change number feature of WhatsApp simply allows us to change the phone number of WhatsApp, migrates all the information in our account, such as our profile information, settings, and groups from our old phone number to the new one. Even this feature also delete the account linked to the old number, so our contacts will no longer see our old number in their contact list. Therefore, it is advisable that we notify our contacts that we have changed their number so that they add us to their list. The only ones who will be notified about our change of number will be the members of the WhatsApp groups to which we belong. When using this feature to change the phone number of WhatsApp, our chat history will be available on our phone with the same phone number, as long as we keep the same phone. However, it is important to bear in mind before changing the WhatsApp number that our new number can receive SMS, to make calls and have an active mobile data connection. Moreover, we also have to check that our old number is currently associated with WhatsApp on our smartphone. To do this, from the messaging application itself click on the menu button, access the settings and tap on the profile photo. After all these things now we can proceed to change the phone number of WhatsApp following these steps that we have mentioned below. So, now without wasting much time let’s get started and explore the whole tutorial. The first thing that we have to do is insert the new SIM card of the new phone number in our device and then open the WhatsApp application. Next, we have to touch on the menu button of the application, the icon with the three stripes at the top, we enter Settings. After the above step now simply tap on the “Account” option. This will show us another screen with several options among which we will find the option Change number. Now after the above step simply tap on the “Next” button. Then you will get a window like this (above image) where you have to put your old mobile number and then the new mobile number. After the above step now it will ask if we want the messaging application itself to send a notification to all the contacts informing that we have changed the number. Now once you choose that option all the members of the WhatsApp groups that we belong to will be informed about the new phone number. Then once we finish the above process, the messaging app WhatsApp will automatically proceed to change the phone number. From that moment only we can simply continue using WhatsApp with the new phone number. Like this, we can easily change our WhatsApp number without losing our chats and groups. So, what do you think about this? Simply share all your views and thoughts in the comment section below. And if you liked this article then do not forget to share this article with your friends and family.